Shoppers in London could soon have to fork out 10 pence (23.4 cents) for every plastic bag they use in a bid to reduce landfill waste. 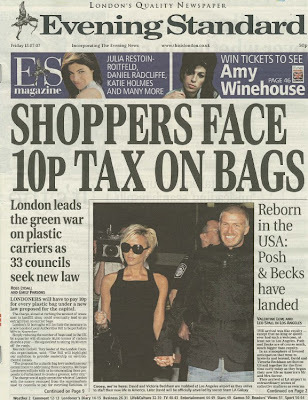 A group of 33 London councils came up with the idea for the bag tax and will put a bill outlining a proposed new law to government MPs in November. If successful, all shops across London would have to charge the fee on every bag they hand out, with the money to be recouped by the councils to pay for recycling. 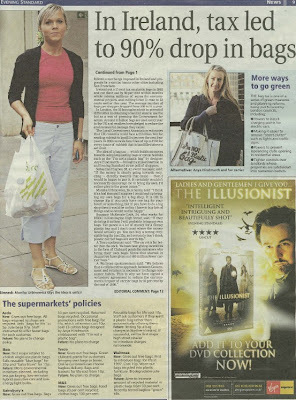 "The proposal for a plastic bag levy underlines our commitment to addressing these concerns," Merrick Cockell, Conservative leader of the London Councils organisation, told The Evening Standard newspaper. "We hope Londoners will join with us in commending these proposals to parliament to create a greener, safer city." The move follows a similar tax introduced in Ireland five years ago, with shoppers charged 15 euro cents (23.8 cents) for every plastic bag they use. The Irish tax, which has since risen to 22 euro cents (35 cents), cut plastic bag use by 90 per cent within months and raised millions of euros for environmental projects. The London councils hope if a similar tax is introduced across the UK capital it will put pressure on the British government to introduce the levy across the nation. Hi , Thanks for the comment on my blog about the Bokashi bins, unfortunately i have not had this problem and everything is tickerty boo. I don't know what to suggest only that you contact who you got them from and try and sort it out with them. thanks mark. I washed the bin now, but the washers still loose. The 2nd bin is fine, so I will request for washers to fit in properly this time. I think the hole is actually slightly big, but also turning the tap on and off it makes the washers looser. So i am not playing with the tap anymore, only once a week.